ㅤô¿ô …Trump’s base is still strong or the Dems wouldn’t insist on sabotaging the border wall. The Dems are desperate for Trump to break his main promise to his supporters. ㅤHowever, unless Beto runs and starts championing conservative values (Beto is from Texas), there isn’t a chance in hell that a Republican will vote for a Democrat. Wall or no wall. ㅤFull story at The Washington Times. Posted here on 12/13/18. See "trump, conservative, politics." ㅤô¿ô …Assuming the Dems nominate Beto, the Dems will win the Presidential election in 2020. Regardless of what Trump says or does. Regardless of which RINO runs against Trump. We can only hope that between now and 2020, the Dems find a way to self-destruct. ㅤFull story at Newsmax. Posted here on 11/23/18. See "trump." ㅤ"Asked about how police should ‘handle’ Antifa, the President responded, ‘These people, like the Antifa you’re talking about, the Antifa — they better hope that the opposition to Antifa decides not to mobilize. Because if they do, they’re much tougher. Much stronger. Potentially much more violent. And Antifa’s going to be in big trouble. But so far they [opposition] haven’t done that, and that’s a good thing.’"
ㅤFull story at Ben Shapiro’s Daily Wire. Posted here on 11/15/18. See "antifa, trump." ㅤ"President Trump announced Tuesday he is nominating Neomi Rao to fill Supreme Court Justice Brett Kavanaugh’s vacant seat on the US Court of Appeals for the D.C. Circuit. ㅤRao currently serves as the administrator of the Office of Information and Regulatory Affairs (OIRA). ㅤShe is a vocal advocate of Trump’s efforts to slash government regulations, crediting the reductions with stimulating job growth." ㅤFull story at The Hill. Posted here on 11/13/18. See "neomi rao, d.c. circuit court, trump." ㅤ"God Bless the USA singer Lee Greenwood appeared on stage Sunday night with President Donald Trump for a rally in Tennessee. ㅤPresident Trump posted a big thank you and ‘GOD BLESS THE U.S.A.!’ to Greenwood following the rally in Tennessee with video of the thousands of rally-goers packing the stadium." ㅤFull story and video at Breitbart. Posted here on 11/5/18. See "god bless the usa, lee greenwood, trump." ㅤFull story and video at YouTube. Posted here on 11/2/18. See “mainstream media, trump”. Like What You’re Reading Here? Join The Fight To Make America Great Again! Become A Supporter On Patreon & Help Fund My Efforts @ Sutter Media! ㅤFull story at Newsmax. Posted here on 10/31/18. See "trump." ㅤ"President Trump will travel Tuesday to Pittsburgh to express support for the victims of the deadly synagogue shooting, the White House announced. ㅤMr. Trump will be joined by first lady Melania Trump to meet with the victims’ families in Pittsburgh, said White House press secretary Sarah Huckabee Sanders." ㅤFull story at The Washington Times. Posted here on 10/29/18. See "trump, pittsburgh, tree of life." ㅤ"Just two week ahead of the 2018 midterm elections, President Donald Trump is enjoying an all-time high approval rating of 47 percent, up three points in one month, according to an NBC/Wall Street Journal poll." ㅤFull story at Breitbart. Posted here on 10/23/18. See "trump, conservative, politics." ㅤ"Trump, by pushing through questions and by capitalizing on an interview approach seeking to synthesize his entire presidency into two segments of television, effectively converted ’60 Minutes’ into a short rally. There are those who will see his rants as worthy, and those who will loathe them; whatever unity can be made to exist by the President exists only within those camps. That ’60 Minutes’ went looking for something greater is more proof than viewers needed that their approach to the President left them outmatched." ㅤFull story at Newsmax. Posted here on 10/15/18. See "trump, 60 minutes, lesley stahl." ㅤTrump fulfilled one of his most important campaign promises by appointing conservative Justices Neil Gorsuch and Kavanaugh to the Supreme Court. The President also promised to right America’s terrible trade deals in 2016. And after Trump negotiated the new USMCA trade agreement, 43% now approve of how Trump is handling trade, an improvement of eight percentage points from last month. ㅤFull story at Sutter Media. Posted here on 10/9/18. See “donald trump, trump, president trump”. Never forget, when Donald Trump announced his candidacy and his policy positions on trade, deregulation, tax cuts, economic growth, tariffs, and everything else relating to employers and employment in America, everybody entangled in the swamp – members of the GOP and DNC alike – stood against him. They mocked his rhetoric when he called out American companies for outsourcing jobs for cheap labor, dismissed it when he pointed out the results of it (loss of jobs for American workers), said he was unhinged when he ripped China – and several other countries – for unfair trade practices, for lop-sided tariffs set against us, for stealing the intellectual property from us, and for devaluing their currency to maintain their artificial edge. ㅤ"’I’ve ordered the FBI to conduct a supplemental investigation to update Judge Kavanaugh’s file. As the Senate has requested, this update must be limited in scope and completed in less than one week,’ Trump said in the statement released by the White House." ㅤFull story at The Hill. Posted on 9/28/18. See "trump, kavanaugh, white house." ㅤ"The aggressive schedule comes as President Trump, in his boldest comments yet, accused Democrats of playing a ‘con game’ with the Kavanaugh pick, and top Senate Republicans said they were tiring of delays and obstruction over allegations that, nearly two weeks after they first emerged, have yet to be corroborated." ㅤô¿ô …Of course. They were waiting for the President to take the heat. Just like they’ve done in the past. Oh well… whatever it takes to hold onto the Senate. ㅤFull story at The Washington Times. Posted on 9/25/18. See "trump, kavanaugh." ㅤFull story is just a click away. Reblogged on 9/21/18. See “trump, rally”. Friday, September 21, 2018: RSBN reporters Alyssa Ashe, Max Kleiber, Tom O’neill and cameraman James Willis will be on hand as President Donald J. Trump holds a campaign style rally at JQH Arena in Springfield, MO. 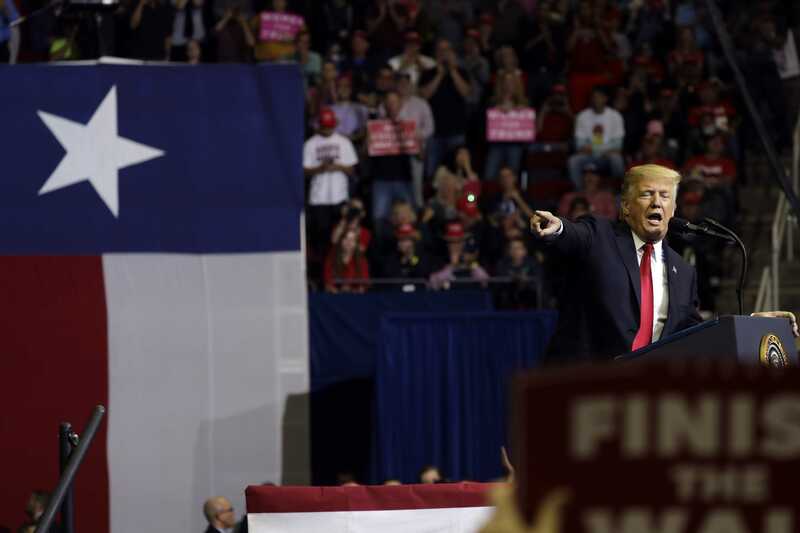 ㅤStory via DC Whispers – "Donald Trump continues to rack up one impressive policy victory after another as America flourishes in this Age of Trump." ㅤFull story at FOX News, image from dcwhispers(.com) – 9/2/18. See "trump." ㅤFull story at The Hill, image from dailycaller(.com) – 8/21/18. See "trump, president trump." Another Prominent Anti-Trump Republican Just Went Down In Minnesota. Here's Why This Keeps Happening. ㅤ"On Tuesday, former Minnesota governor Tim Pawlenty was rejected by Republican voters in his gubernatorial primary with Jeff Johnson, a commissioner from Hennepin County. The main cause of his defeat: failure to follow President Trump with enough alacrity…"
ㅤFull story at Ben Shapiro’s Daily Wire – 8/15/18. See "tim pawlenty, trump." London Mayor Approves 'Angry Baby Trump' Blimp For Flyover During President's Visit To U.K.
ㅤ"’I’ve got it narrowed to about five,’ the President told reporters on Air Force One en route to his New Jersey golf club, where he said he plans to interview one or two candidates this weekend." ㅤô¿ô …It’s cool that Trump meets leaders at one of his swanky properties rather than ho-hum, Camp David.